Many of the staircases were initially built to connect hills residents to streetcar lines. A couple of years ago, I began having severe pain in my arms and wrists due to excessive computer work. Months of doctor's visits, physical therapy, acupuncture, and various "alternative" treatments did little to quell the numbness, tingling, and stabbing sensation — a result, the doctors said, of carpal tunnel, cubital tunnel, and tendonitis. Instead of the surgeries my doctors recommended, I decided to take a few months off. All the experts agreed I needed to exercise more, but almost every activity — lifting weights, swimming, running, riding a bike — exacerbated my symptoms. The only thing I could do without pain was walk. So that's what I did. One day, I left my apartment and headed toward the Oakland and Berkeley hills. Unsure of where I was going, I just kept walking. 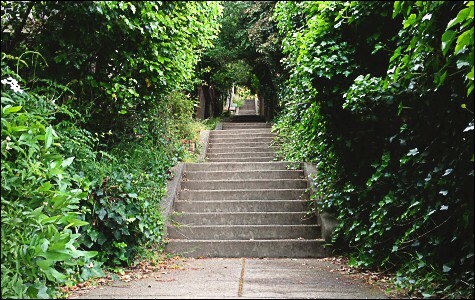 Eventually I came to a cul-de-sac, but I had an inkling that there was a walkway that connected it to another street above — a distant memory from my youth, when I used to navigate the hill's passageways on a much more regular basis. Sure enough, there was a passageway. And that led to another one. Going on instinct or perhaps my foggy memory, I found myself zigzagging the hillside using these walkways and staircases. Maybe because it had been so long since I had done so, it felt like I was rediscovering a secret, but also gaining access to another world. The paths lead past lushly landscaped backyards of houses I will most likely never be able to afford, yet they are public walkways that anyone can enjoy. They felt like a sanctuary. 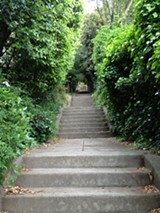 They were also a good workout, and one with a payoff: Many of the staircases extend far up the hill, leading to expansive views of the Bay Area. Every day, I found myself drawn to the staircases. I stopped bringing my iPod on these excursions because the quietness of the walks felt more nourishing than even my favorite bands' songs. After I had sufficiently explored the paths in one area, I itched to find more. 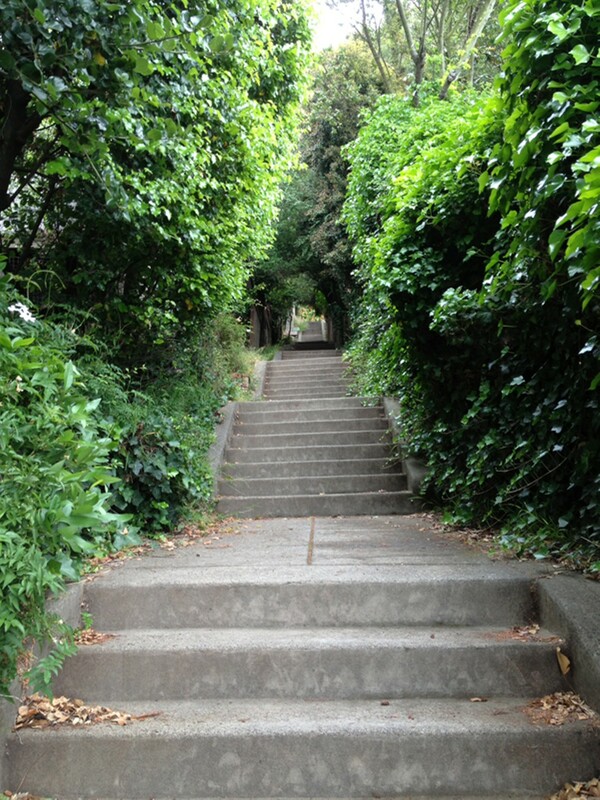 A co-worker gave me Secret Stairs: East Bay, a guidebook that groups the East Bay's hundreds of staircases into walks of various lengths and difficulties, and soon I found myself obsessed — I made it my goal to walk every single staircase of the East Bay. Despite having lived in the East Bay my entire life, I found there was still much to discover. Parts of the El Cerrito hills felt like I had stumbled upon The Shire. There were also far more staircases and paths than I realized (more than four hundred, according to Secret Stairs). I marveled at creeks and trails and mini waterfalls and neighborhood parks and redwood groves I never knew existed, or had forgotten about. I came across deer and turkeys and cats and backyard chickens. More than a few times I had to double-check with the book to make sure I wasn't trespassing onto private property. The staircases were initially built to connect hills residents to the Key Route streetcar lines. These days, they are in various states of maintenance. Some of them are overgrown and crumbling apart (mostly in Oakland), while others are immaculately maintained and charmingly landscaped (mostly in Berkeley). I learned that many of them were newly restored or built thanks to the volunteers of the Berkeley Path Wanderers Association. With each walk, I found my pain — and my stress level — diminish. When I was well enough to return to work, I kept exploring the hills. One hot Saturday morning I decided to volunteer with the Berkeley Path Wanderers Association to help clear an overgrown staircase in the North Berkeley hills. The handful of volunteers spent hours clearing weeds and trimming branches. Ironically, an activity that initially attracted me for the solitude it provided ended up connecting me with others. Afterward, we sat on the newly swept stairs, enjoying the view.